Ambar Beach Resort & Spa Hotel is a 4 star complex overlooking Butihondo Beach which takes about 5 minutes to get to by foot. Butihondo Beach is one of the best beaches in the Canary Islands. There are many sun loungers and parasols to relax on and a variety of water sports to try out. Have a go on a jet ski, try water skiing or hire a pedalo for a relaxing bob on the sea. If you don't fancy any of the water sports why not just take a cooling dip in the beautiful sea. 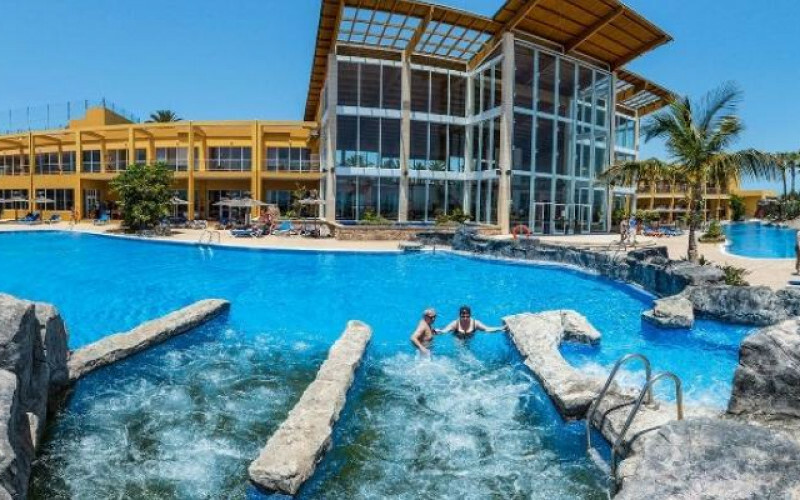 Jandia resort centre is jam packed with bars, restaurants and shops. The centre of Jandia can be found approximately 5 km from the complex, just a short taxi tide away. There are plenty of shops to wander round and get your souvenirs to take home. If you want an evening out there are many restaurants and bars to try then maybe head to one of the nightclubs in the resort centre. Slightly further afield is the harbour at Morro Jable at 9 km. The complex has a stunning pool area with 2 large swimming pools with Jacuzzis and palm trees. Surrounding the swimming pools is a relaxing sun terrace with an abundance of loungers and parasols. Relax on a lounger, watch the kids playing in the separate kids pool with a cocktail in hand. You can always admire the stunning sea views from the comfort of your lounger. The poolside bar serves a variety of drinks including beer, wine, soft drinks, tea, coffee and cocktails which you can enjoy on your sun bed or at one of the comfortable chairs and tables in the shaded area. Ambar Beach Resort & Spa Hotel has its own Spa which offers guests an indoor swimming pool, whirlpool, saunas, steam bath and an area dedicated to relaxing. This is where to head to for some peace and tranquillity in a relaxing environment. If you are more active the complex also has a gymnasium with modern equipment, a multisport court and a diving centre attached to it. The 24 hour reception desk has staff to help assist you with money exchange, internet access, laundry service, n=medical assistance, bicycle rental, meeting facilities, TV room and a games room. There are Wi-Fi hot spots throughout the hotel. Meals are served in the main restaurant which is air conditioned. You can choose from a variety of traditional dishes as well as international dishes. After a relaxing evening meal the next stop is the Lounge Bar where you can work your way through the cocktail list or just enjoy an after diner coffee, the choice is yours. Regular entertainment is held at the stage area in the Lounge Bar. Ambar Beach Resort & Spa Hotel has a total of 244 rooms and suites including 8 Junior Suites and 4 disabled rooms. Each room and suite comes fully furnished and well decorated. They all have satellite TV, fridge, telephone, bath, shower, hairdryer, safety deposit box, air conditioning and a balcony or terrace.